This article is an invitation to Shapership. it will be published in two parts. The second part will be published next week. What we introduce in this article is a new concept which, we hope, will open new windows in your mind and be an inspiration to anyone, regardless of gender, race, education level or status – to become a Shaper of the Future or to add certain dimensions of “Shapership” to their current existence. Shapership is the Art of shaping new Realities, open up new paths to the Future and bring significant and beneficial changes to Society. The word associates “Shaping” (as in “shaping a diamond”) and Leadership (meaning “leading an initiative”). We have been looking at people who illustrate this concept. We call them Shapers: people who bring new Shapes to Society and have a durable impact. 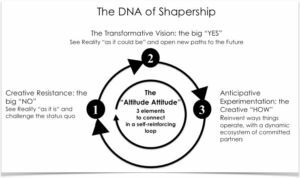 We identified that Shapership is above all a way to look at the world. It means facing Reality in creative, visionary and sometimes revolutionary ways, with a clear acknowledgment of “what is” and a transformative Vision of “what could be”. As you will see, Shapership is also based on a deep connection between Head, Heart and Hands. Because that’s what the world needs: new shapes, new forms, new perspectives and approaches. Because it is obvious that we cannot solve 21st century issues with 19th and 20th centuries ways of thinking and acting. We need a shift in perspectives. More and more people know they cannot wait for some “enlightened” leaders to make those changes. We have reached a time where many people “at the top” want to retain power although they lack the needed “Authority”, inspiring Vision, Wisdom and Awareness. For many reasons, these people tackle an Eco-System Reality with an Ego-System perspective. Many people – and among them some really young people – feel in their heart an aspiration to live a meaningful life and to make a difference rather than to make a career. They know our ways of life – and our ways to destroy Life – must make place for other ways to See, Think and Act instead of keeping conforming to obsolete modelsThe fact is, in today’s interconnected world, you no longer have to hold a Leadership position to take a stand, do something important, and make an impact on Society. Shapership is neither Leadership, nor Entrepreneurship. Shapers have been around as long as we can remember! They appear in every country, social groups, fields of activity, age-brackets, genders, races and contexts. In certain cases, they have been asked – or pushed – to become Leaders. But many of the Shapers operate neither as Leaders nor as Entrepreneurs, although they inspired quite a few. At the core of Shapership, is a completely different way of Being, Seeing and Acting. Shapers operates from a new level of Consciousness, way beyond Ego-awareness. They open meaningful and progress-generating trails for the whole human “Eco-system” that people may decide to follow. Shapers are pioneers. They are trailblazers, opening possible paths into the Future, which, at first, are invisible to others. They dare a creative reconstruction of Reality “as it could be”, an audacious Vision of a Future that could be created… They open new worlds. Even if, in the meantime, Shapers have died or “accidentally” lost their reputation or their Freedom, their heritage belongs to Humanity. They generate “Cultural Revolutions”. You might recognize some of them in this picture. • Salman Khan, (Bengal, United States, 1976 – ) Shaper of Education for Many. 1. Creative Resistance: the Big “NO”. It starts with a way to look at “what is”. Shapers look at reality square in the face. They feel a deep and sincere “NO” to a situation considered as “normal” by a vast majority of people. They sense the need for “something else”: Status quo has to be disrupted. Creative Resistance leads to a desire to move forward and shape the Future through Creative Transformations. Shapers take a stand! 2. Transformative Vision: the Big “YES”. It is a way to look at “what could be”. Shapers are driven by a meaningful and transformative Vision of reality and a deep commitment to make it happen. It is a big “YES” to a desired Future, something that “needs to happen” because it represents the hopes of many and enhances the dignity and the meaning of human life. So, even if others think it is “impossible”, Shapers fully engage and make the impossible possible! 3. Anticipative Experimentation: the Creative “HOW”. A transformative Vision calls for transformative actions. Shapers often completely reinvent the ways things work. Because key issues require system solutions, they abolish competition and create new forms of collaboration. They rally a dynamic ecosystem of partners, so that Anticipative Experimentation becomes a space for Co-creation. Whether it is through a movement, a company, a community, Shapers unite people around shared Purposes! As an example, look at the fantastic story of Aravind Eye Care Hospital founded by Doctor V, a retired Indian Eye-Care surgeon. 1. The Big “NO”: In India, 12 million people become blind each year because of lack of preventive Eye care. Dr. V. found this situation unacceptable. 2. The big “YES”: at age 55, he decided that his Purpose would be: “eliminate needless Blindness among the poor in India”. 3. The Creative “How”. Driven by his higher purpose, Dr. V. founded Aravind Eye-Care Hospital in 1976. Started with 11 beds, Aravind has since grown into the world’s largest provider of Eye-care: ”Aravind Eye-Care System”. Today, it is a model of efficiency, admired all over the world. To provide high quality eye-care services at low price required an “ecosystem” and “out-of-the-core-business” approach: training women in rural India for Eye diagnosis, educating non-physicians to gather diagnostic data and counsel patients, creating telemedicine centers, creating a transportation service to bring people to the hospital, setting a glasses factory, etc. Today, Aravind manages 2.5 million outpatient visits and 300,000 eye surgeries a year. It has been calculated that Aravind does 60 percent as many eye surgeries as the United Kingdom’s National Health System per year, at one-hundredth of the cost. The system makes enough on paid surgeries, not only to cover the 55 % of patients who cannot pay the market rates, but also to generate a nearly 40 % gross operating margin. In the meantime, since the notion of “competition” has no meaning to them, they share their best practices all over the world. Why? Because their Vision 2020 is “To eliminate needless Blindness worldwide”.